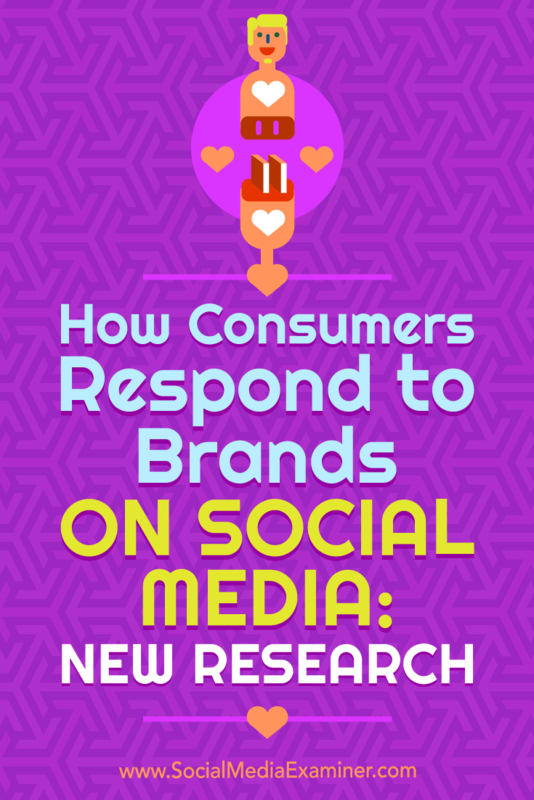 Want to know why some brands connect with consumers more than others on social media? Wondering if the tone of your social media marketing is affecting sales? In this article, you’ll find insights from new research that reveal how consumers feel about the content and conversations businesses are serving up on social media. 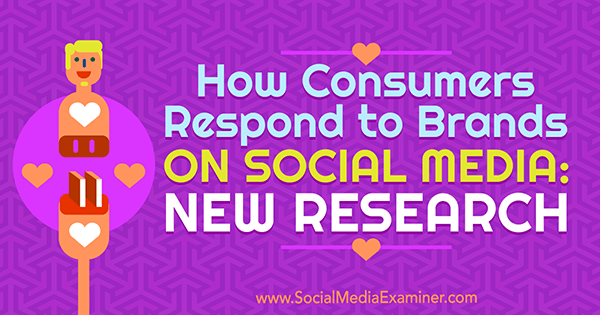 How Consumers Respond to Brands on Social Media: New Research by Michelle Krasniak on Social Media Examiner. 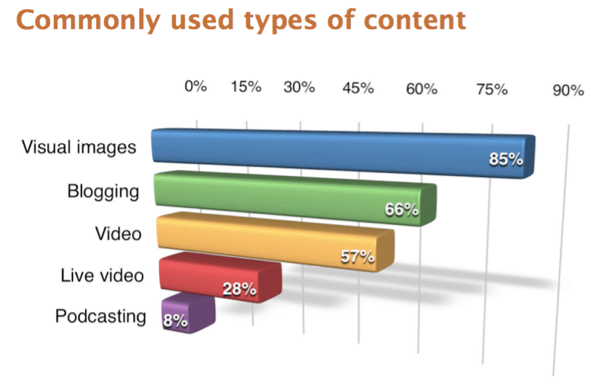 It’s not only about what types of content you post, according to a recent study by Sprout Social. 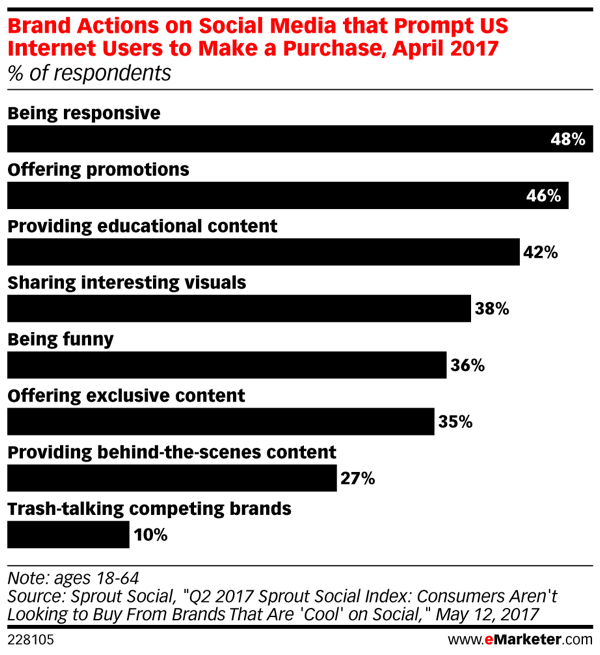 For their Q2 2017 Sprout Social Index report titled, Consumers Aren’t Looking to Buy From Brands That Are “Cool” on Social, they studied 289,000 public social media profiles and surveyed more than 1,000 consumers and found that nearly half of respondents (48%) want to purchase from brands that are responsive to their customers on social media. This supports the basic premise of social media marketing: It’s about the conversations you have with your audience. Furthermore, 36% of respondents say that when a brand is humorous, they’re more likely to buy from them. How different brand actions on social media impact consumer purchases. Interestingly, while 67% of respondents say they don’t like it when brands make fun of competitors, 10% of people surveyed say that they’ll purchase from brands that trash-talk competitors. 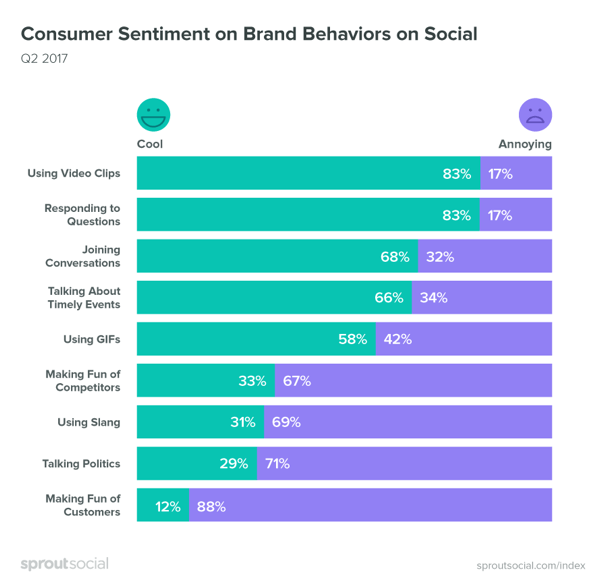 In fact, Sprout Social found several things that brands do that their audience dislikes including making fun of customers (88%), talking politics (71%), and using slang (69%). It’s important to pay attention to consumer sentiment when it comes to social media content. 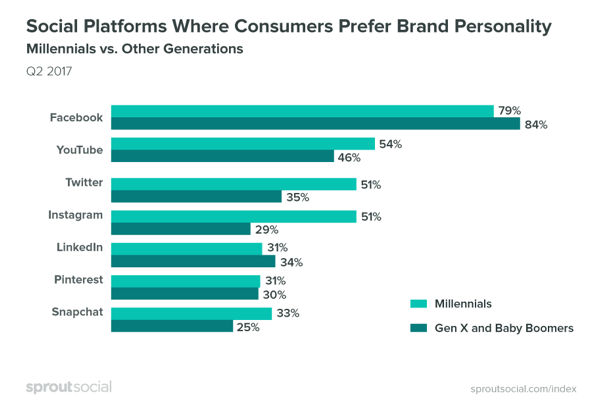 Not surprisingly, audience preferences on the personality a brand projects on social media depends on the platform. For example, Sprout Social found that 79% of Millennials and 84% of other generations prefer brands to let their personalities shine on Facebook, while 51% of Millennials and 35% of other generations like it on Twitter. This could have a lot to do with the types of content posted on the respective sites. On Twitter, brands must be concise and link to other types of content, while on Facebook, the audience can consume much of the content directly on the platform. There’s more space to write interesting or funny descriptions on Facebook, allowing for the brand’s personality to be communicated better. Consumers prefer brands to be more personable on Facebook. There doesn’t seem to be a “three strikes and you’re out” rule when it comes to how consumers feel about a brand’s social media activities. 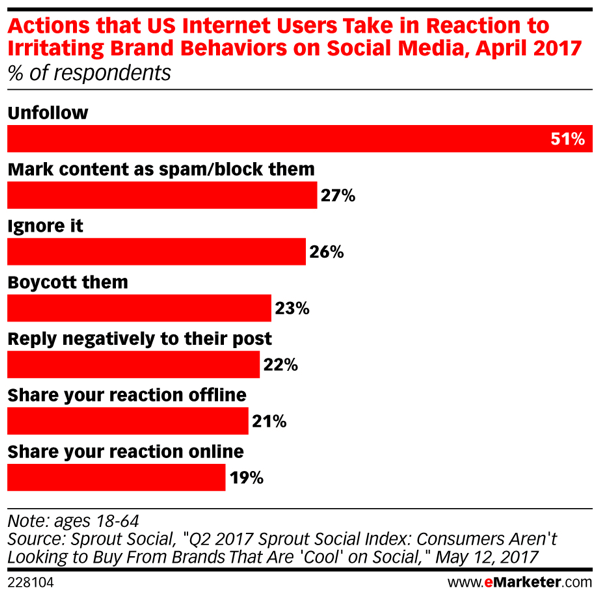 Sprout Social learned that 51% of respondents will automatically unfollow a brand that does something they dislike, while 27% block them or report them as spam. Just over one-quarter (27%) go as far as to boycott the brand entirely. Internet users have little patience for brands posting bad social media content. One exception to this is when the brand has an ardent (read: rabid) fan base. While it’s unlikely Apple would post something offensive or make fun of their competitors, their following would probably be more forgiving. That’s not to say that everyone would turn a blind eye to something they find offensive, but chances are good that there won’t be any massive unfollows or boycotting going on. Social Media Examiner’s 2017 Social Media Marketing Industry Report revealed that marketers have the right idea when it comes to the types of content they post: The vast majority use visuals. Eighty-five percent of respondents said they use visual images, while 66% said they blog and 57% report using video content. Respondents to the 2017 Social Media Marketing Industry Report survey reported visual images as the most-used content type. SEOPressor.com, in their article “The Science of Emotion: 4 Keys to Effective Social Media Marketing,” wrote that positive and uplifting content garners more shares than content that’s perceived to be sad. Awe-inspiring content does well, too. The idea here is that you want to elicit emotions from your audience… preferably positive ones. That doesn’t mean there isn’t a place for content that provokes anger or sadness. Take for example the American Society for the Prevention of Cruelty to Animals (ASPCA) commercial featuring singer Sarah McLachlan singing her hit song “Angel” while a montage of sad images featuring abused and neglected animals plays on screen. You’d be hard-pressed to find a human being who saw that commercial and felt nothing. In fact, within two years, that commercial was credited with bringing $30 million in donations for the organization. Showing emotions humanizes brands, and people buy from people. When brands post content that makes people feel something, they’re more likely to want to pass that feeling along to their family and friends. There’s not a person among us who hasn’t pressed the Share button on a meme that features an inspirational saying or a video featuring funny cats doing what cats do. We want to share that experience, or a cause that we’re passionate about, with the people in our lives. It’s important to take a holistic approach to your social media marketing. Human beings are complicated, and a one-size-fits-all approach to posting content doesn’t work. Brands should look beyond just posting funny pictures or informational videos. They should consider how the content will make the audience feel and if it will elicit some kind of emotion. What do you think? What types of social media content and posts work best for your business? Where do you show the most personality? Share your thoughts and questions with us in the comments below.